The Yeung (Yang) family’s tai chi chuan style is unique to the Yeung (Yang) family. It was started by Mr. Yeung Lo Sim (Yang Lu-chan), who was born over two hundred years ago, and has been passed down to family members, generation after generation to the present day. The lineage under discussion is that of Mr. Yeung Sau Chung (Yang Zhen-ming), the eldest son of Mr. Yeung Ching Po (Yang Cheng-fu). Mr. Yeung Sau Chung moved to Hong Kong with his family in 1949, and continued to dedicate his life to practicing and teaching his family’s tai chi chuan style until his death in 1985. Since that time, his family also has been devoted to practicing and teaching this tai chi chuan style. Mr. Yeung taught for over fifty years, and his daughter Ms. Yeung Ma Lee has been teaching for over twenty years. Over these seventy years, they both have taught many students. Their method of teaching is personal and individualized. Through this methodology, they have employed various approaches that take into consideration the individual’s learning level capabilities and physique. Category one is family. Yeung family members are taught the complete body of knowledge. In the family, the methods and formulas are observed most strictly, and the teaching methods employed are quite severe. While all family members learn, not all like teaching and not all take disciples. Category two is disciple. Generally, a disciple is required to spend a specific amount of time studying with the teacher before being considered for discipleship. Once accepted, disciples would acquire from the Master skills that lead to a level of comprehension that far exceeds that of students, so that they can help the master to spread the martial art. A disciple is allowed to use the Yeung’s family name when teaching. Disciples can also choose to take their own disciples. 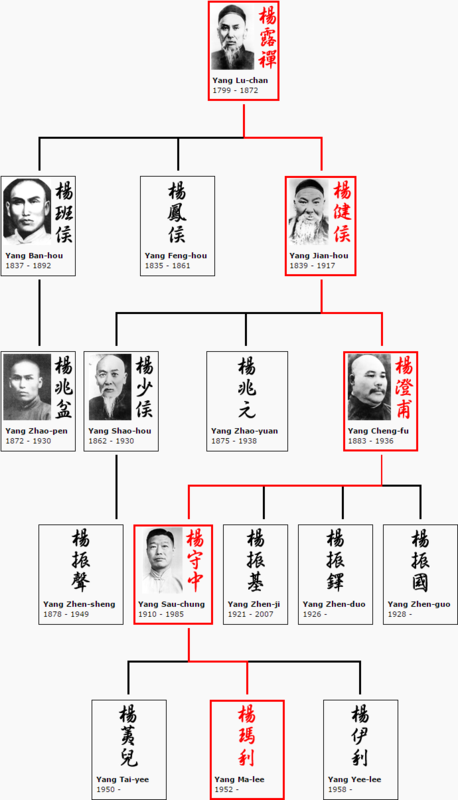 All disciples are listed in the “School of Yeung’s style of Tai Chi Chuan,” but not in the Yeung’s family lineage, despite the fact that some people shamefully promote themselves this way. Category three is student. The level of training students receive is less profound than that of disciples, and whether a student is qualified to teach is up to the judgment of the master. The Yeung family itself has published books about tai chi chuan. One must understand that books only serve as a guide. You can only learn the art well with instructions from the Yeung family. Recently a movie of Mr. Yeung Sau Chung surfaced on the internet (without family permission). The same principle applies. It may be the best form one has ever seen, but without the underlying formula, it is impossible to learn from it. There are a lot of claims by some people saying that they are practicing the “real” Yeung’s style, or that they possess the “forgotten secrets,” etc. It is absolutely important that the followers should exercise utmost caution to discern the authenticity of these claims and whether the martial art is appropriate for their physique. Otherwise, not only is it a waste of time and money, it might also cause serious injury. The Yeung’s style Tai Chi Chuan is both an extraordinary defensive art as well as an unparalleled health maintenance exercise. However, the principles and applications are only as valuable and effective as the source from which they spring. Know your source. Much has been written about “Yang style” Tai Chi Chuan. Yang style is perhaps the most popular style of Tai Chi Chuan in the world. Of course, “Yang style” refers to an exceptionally sophisticated and effective martial art named eponymously after the “Yang” family, or more properly, according to the correct pronunciation of the family’s name, the “Yeung” family. There is a substantial difference between the popular art called “Yang style” Tai Chi Chuan and what is meant when we refer to “Yeung Family” Tai Chi Chuan. Indeed, this is one of the reasons we created this site, to properly honour and promote the art that we have learned from the family passed down from our teacher, Jim Uglow, a Direct Student of Yeung Ma Lee (Mary) Sifu, in turn, passed down from her father Yeung Sau Chung. It should be emphasised that a number of us involved with this site have had the great pleasure of learning directly under Mary Sifu’s instruction and can attest to her knowledge, wisdom, and skill. Mary Sifu has two sisters, Amy and Agnes, both of whom do not teach but who were also steeped in the Family’s tradition. The fact that Tai Chi Chuan is so well-known universally could be attributed to the painstaking efforts of my great grandfather, Mr Yeung Lo Sim, a devoted and dedicated teacher who, having learnt it from Mr. Chan Cheung Hing, spent his whole life in training thousands of his followers in Peking. My grandfather, Mr Yeung Kin Hou and granduncle, Mr. Yeung Ban Hou followed his footstep. My uncle, Mr Yeun Siu Hou and my father, Mr Yeung Ching Po had also taught many students in various parts of China. In 1949, I came to Hong Kong from Canton and I have been continuing to dedicate myself to this profession. As a result, Tai Chi Chuan becomes very popular in Hong Kong and overseas, particularly in the recent years. It is, indeed, the efforts of four generations!